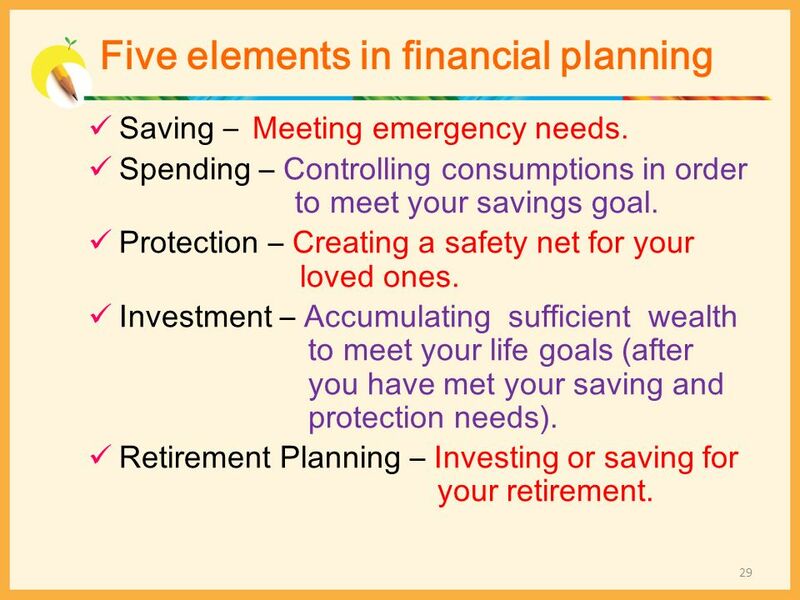 Learning how to manage money as a life planning process. Establishing proper values by learning and experiencing how to manage and utilize wealth effectively. Mastering life skills in order to seize opportunities and meet challenges. 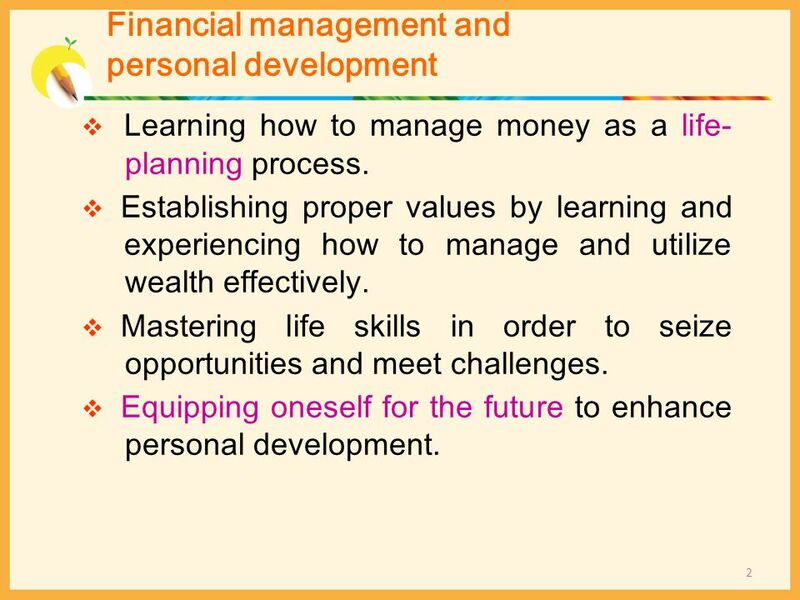 Equipping oneself for the future to enhance personal development. 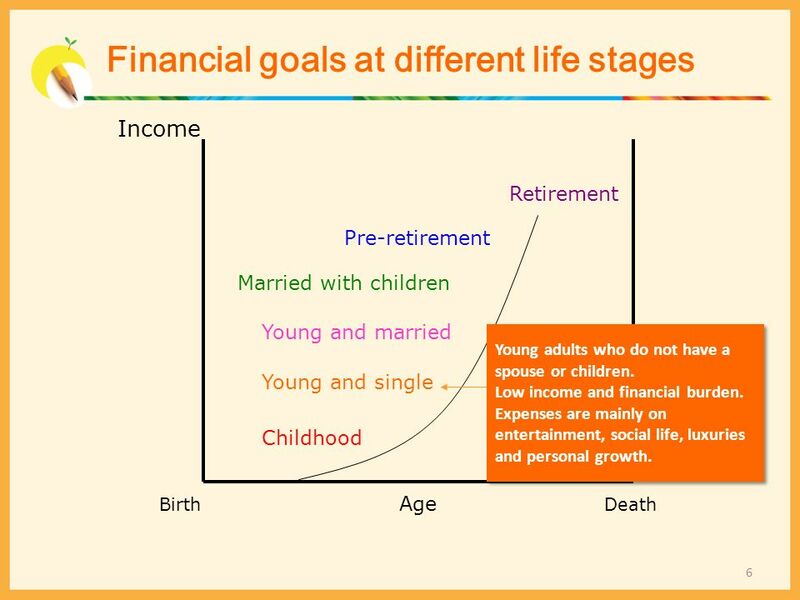 3 What is financial planning? Self-management: money, time and emotion. 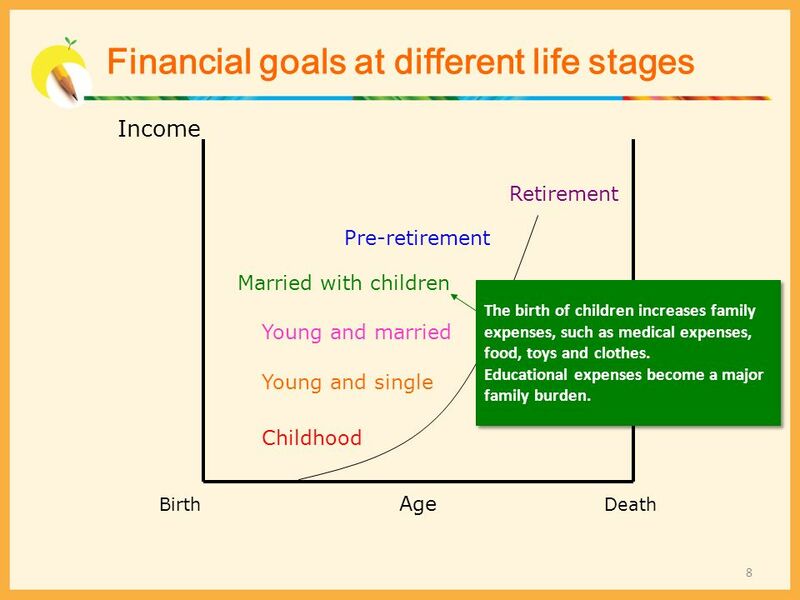 Financial planning is the process of attaining life goals through properly managing personal finances. 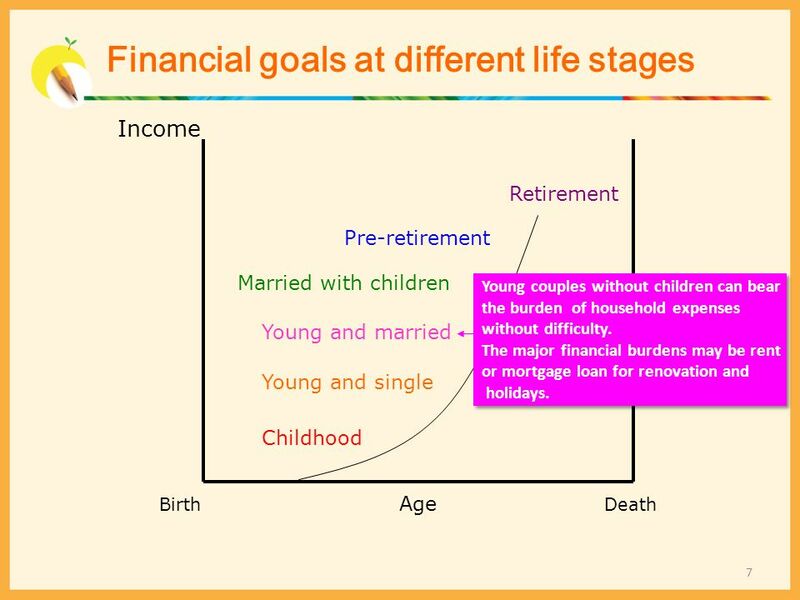 For example, set a savings plan and invest % of savings in shares for 10 years in order to have enough money to buy a flat. 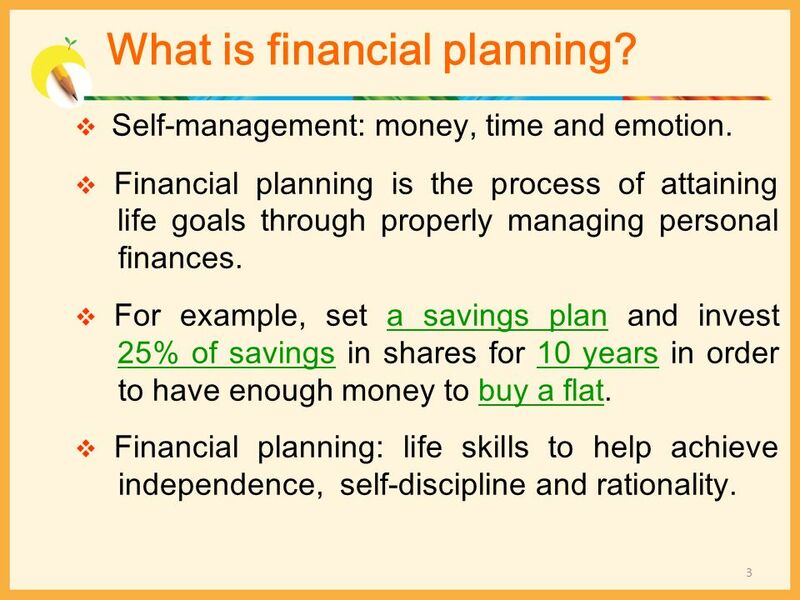 Financial planning: life skills to help achieve independence, self-discipline and rationality. Savings deposits. 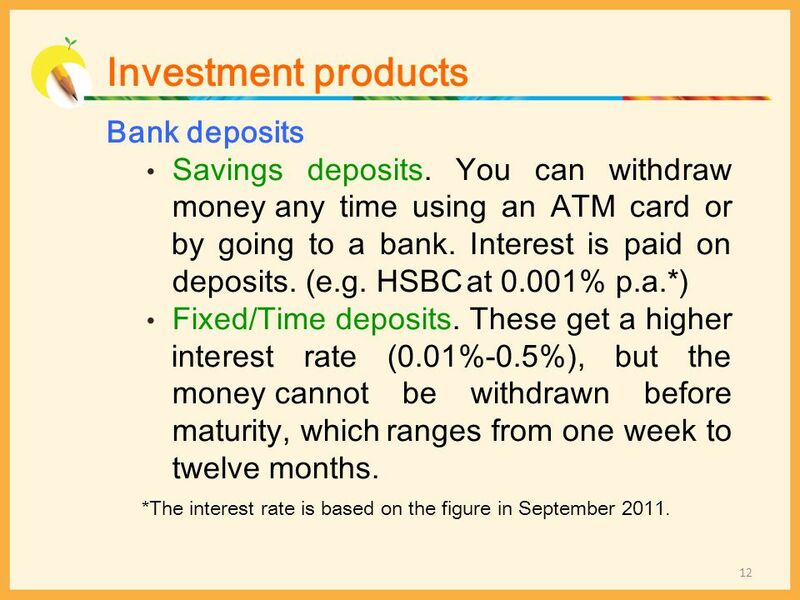 You can withdraw money	any time using an ATM card or by going to a bank. Interest is paid on deposits. (e.g. HSBC	at 0.001% p.a. *) Fixed/Time deposits. 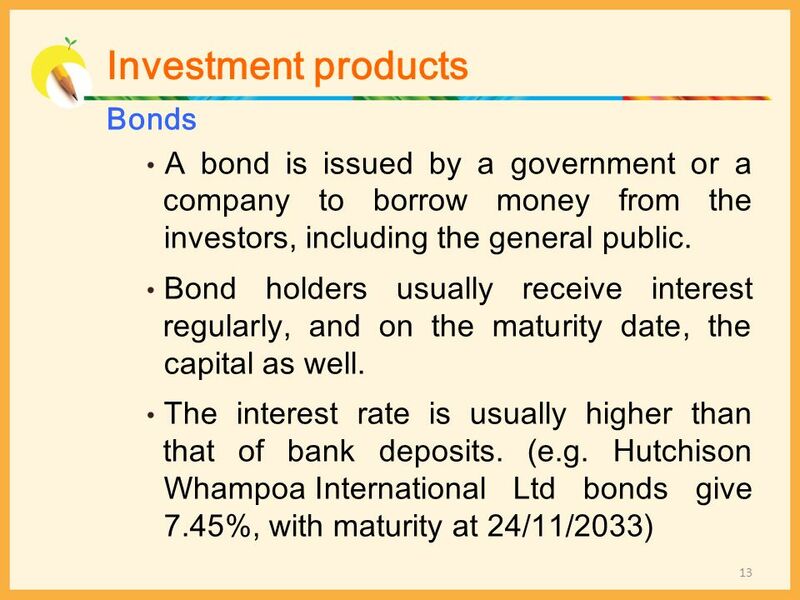 These get a higher interest rate (0.01%-0.5%), but the money	cannot be withdrawn before maturity, which	ranges from one week to twelve months. *The interest rate is based on the figure in September 2011. 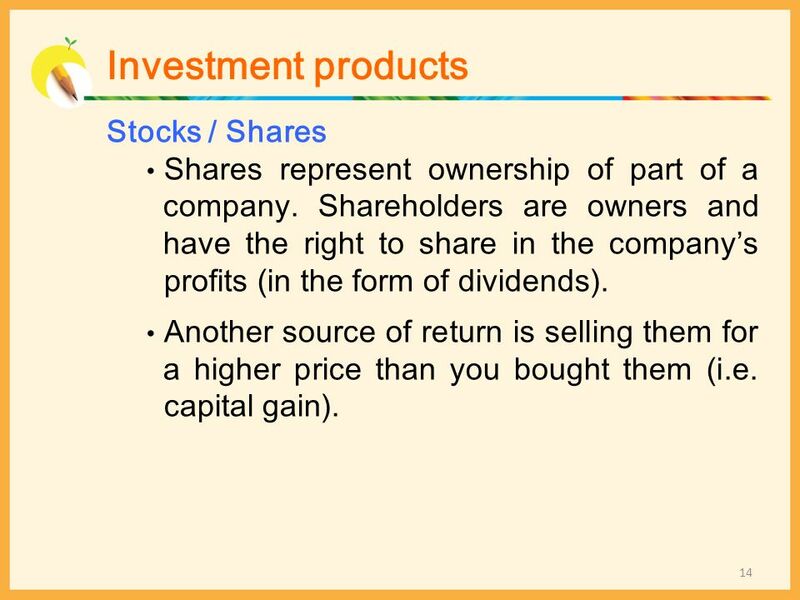 Shares represent ownership of part of a company. Shareholders are owners and have the right to share in the company’s profits (in the form of dividends). Another source of return is selling them for a higher price than you bought them (i.e. capital gain). Term insurance covers basic protection needs at the lowest premium. There is a savings element in certain types of policies. 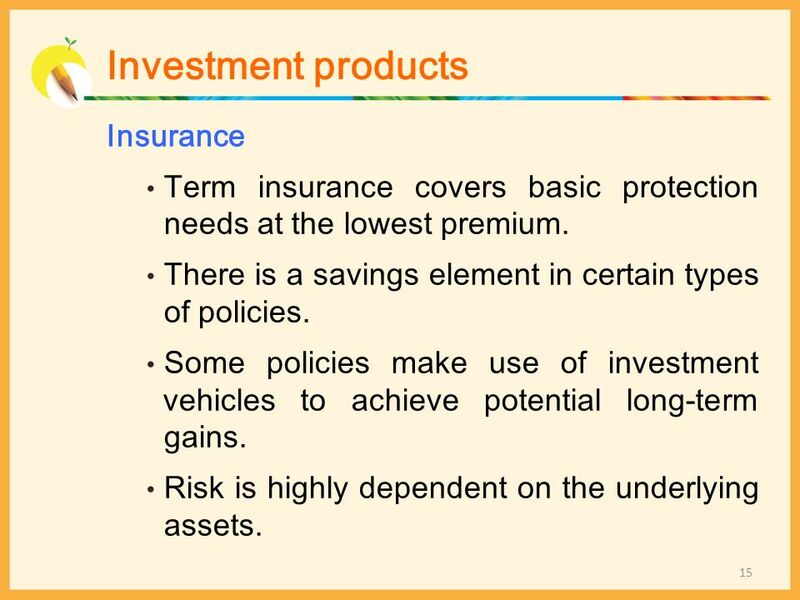 Some policies make use of investment vehicles to achieve potential long-term gains. Risk is highly dependent on the underlying assets. 17 What is the MPF? 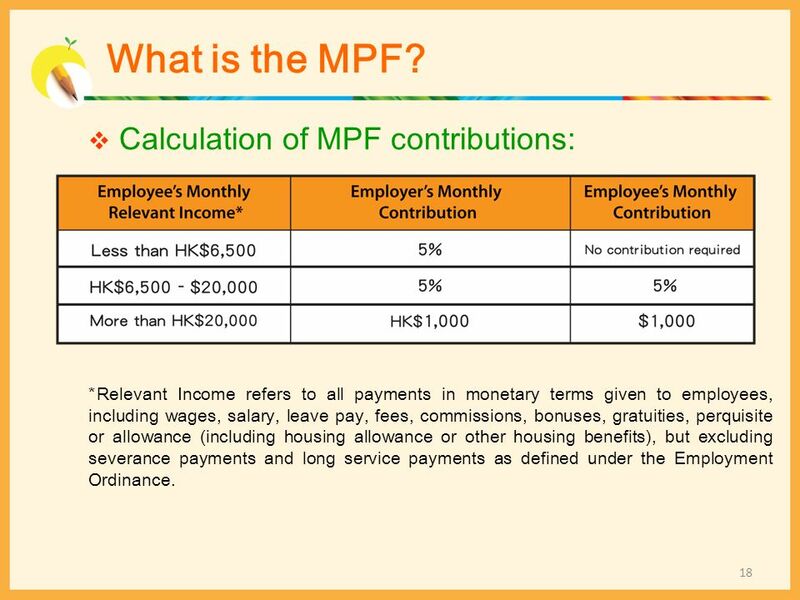 The Mandatory Provident Fund (MPF) System, which was implemented in December 2000, aims at providing basic retirement protection for the Hong Kong workforce. 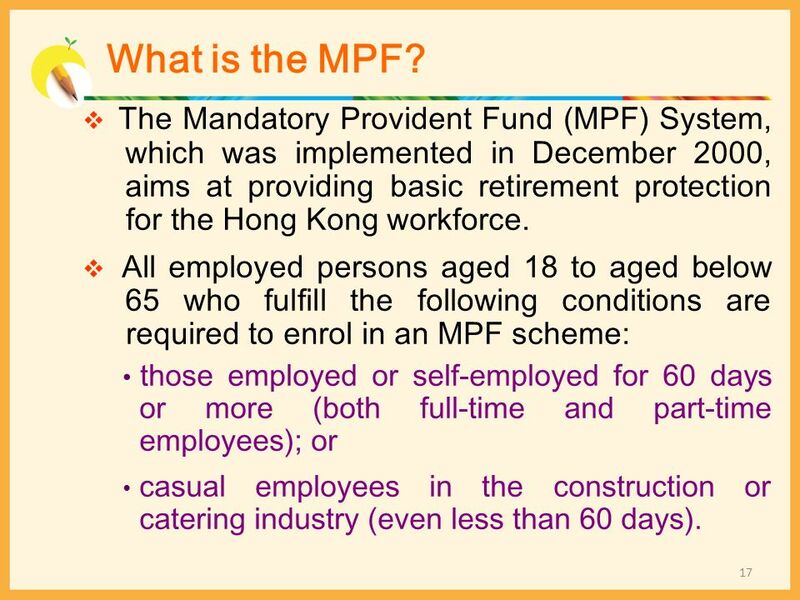 All employed persons aged 18 to aged below who fulfill the following conditions are required to enrol in an MPF scheme: those employed or self-employed for 60 days or more (both full-time and part-time employees); or casual employees in the construction or catering industry (even less than 60 days). *Relevant Income refers to all payments in monetary terms given to employees, including wages, salary, leave pay, fees, commissions, bonuses, gratuities, perquisite or allowance (including housing allowance or other housing benefits), but excluding severance payments and long service payments as defined under the Employment Ordinance. 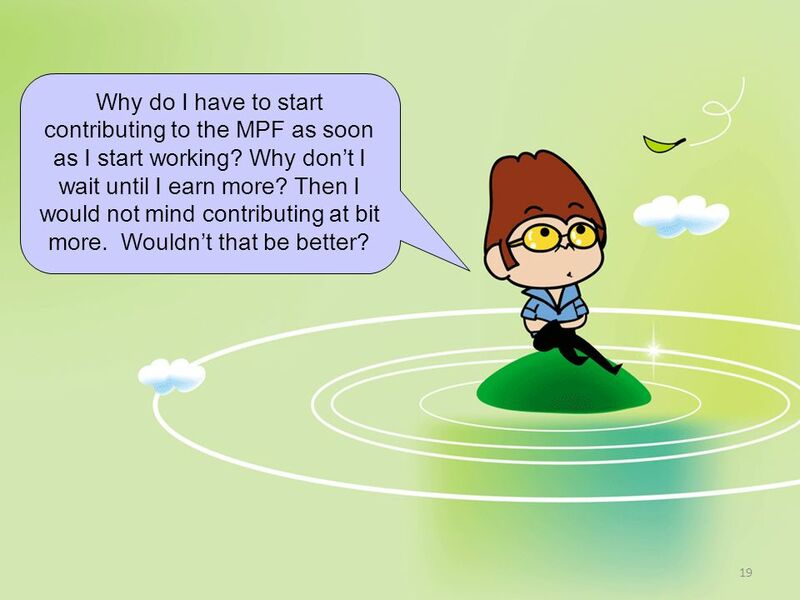 19 Why do I have to start contributing to the MPF as soon as I start working? Why don’t I wait until I earn more? Then I would not mind contributing at bit more. Wouldn’t that be better? CAPITAL is dependent on your personal situation (e.g. income stability, cash flow requirements). RATE OF RETURN is the most uncertain variable since it can be affected by different factors (e.g. market fluctuations, investment risks). TIME (i.e. 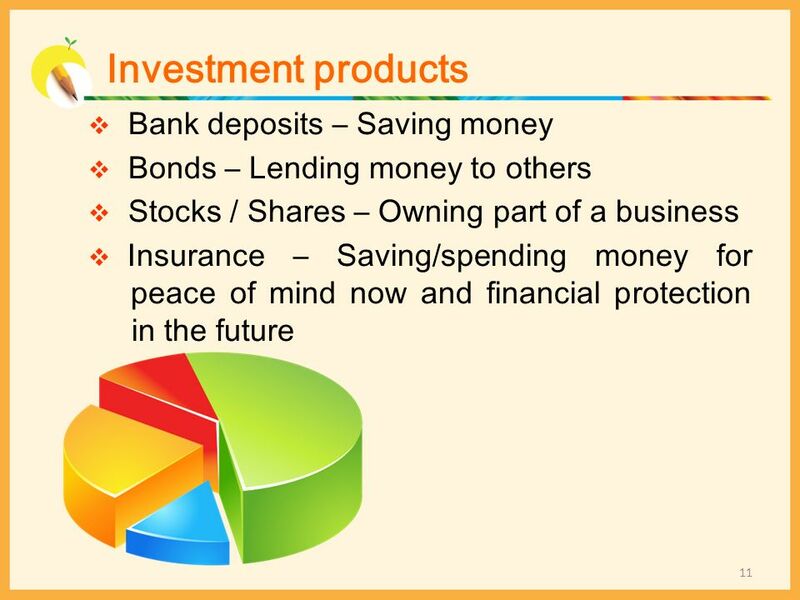 investment period) is relatively easy to plan for and control. 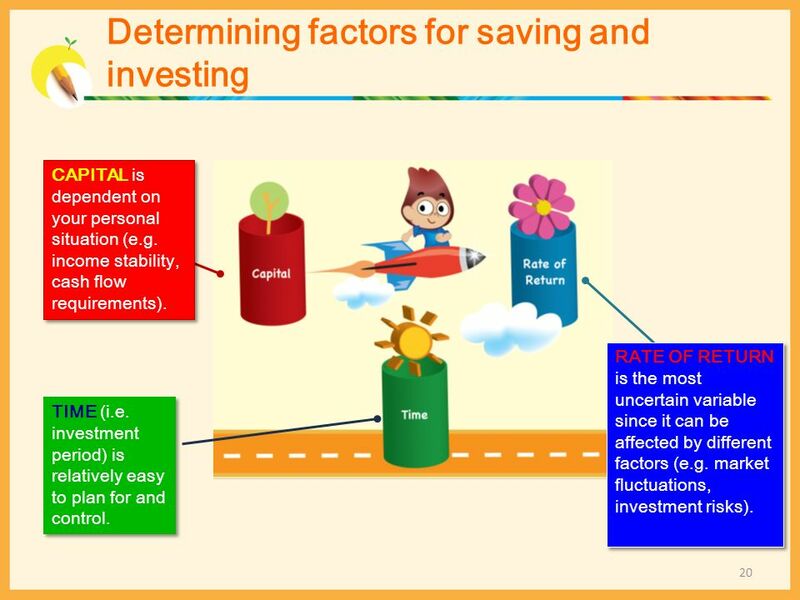 If you have limited capital and a short investment period, the rate of return has to be increased. 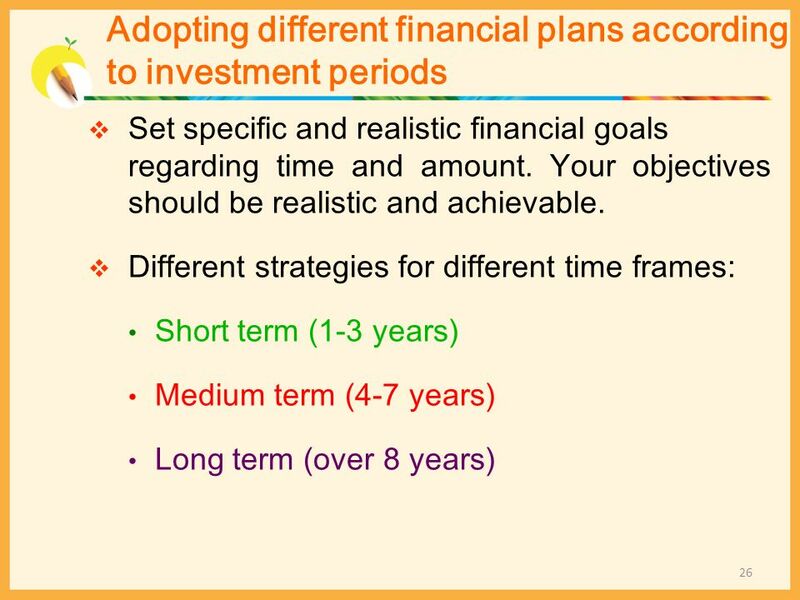 If you have a short investment period and the rate of return cannot be increased, your capital has to be increased. 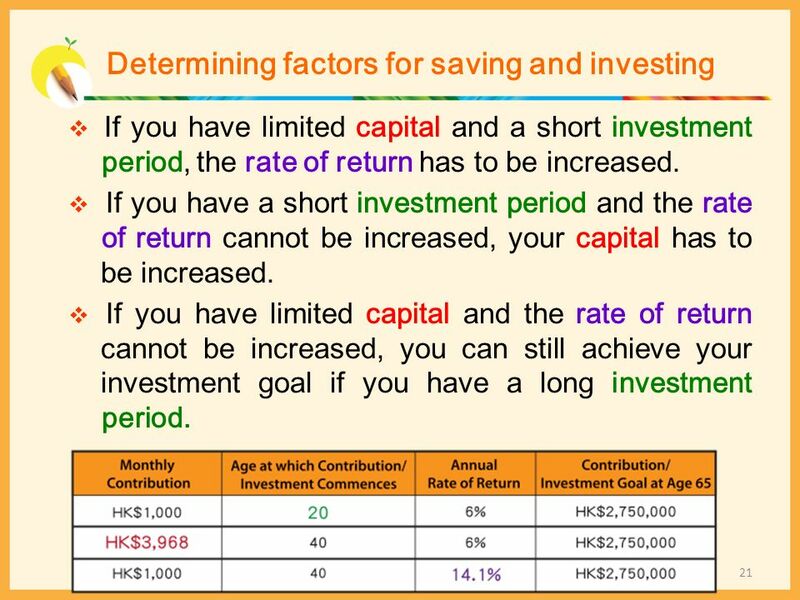 If you have limited capital and the rate of return cannot be increased, you can still achieve your investment goal if you have a long investment period. 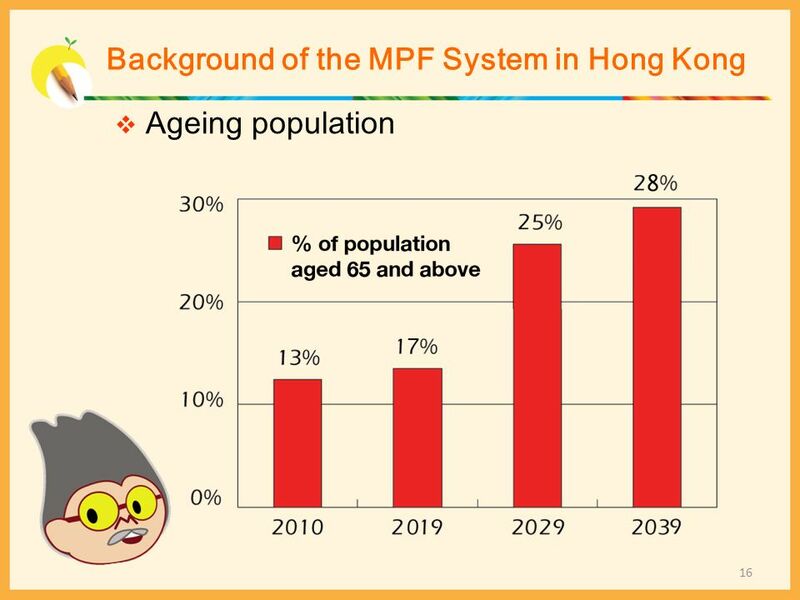 The MPF is a very long-term investment, so the interest added to your capital continues to roll over and generate further interest, i.e. 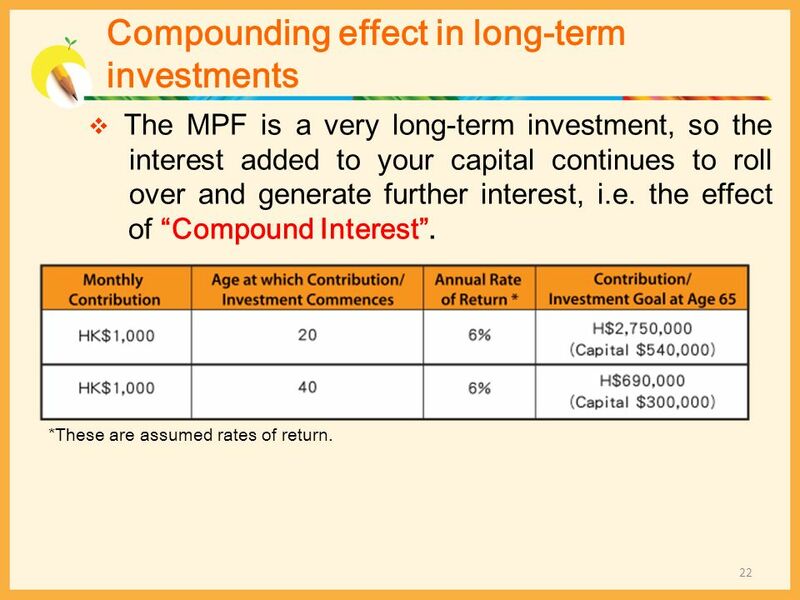 the effect of “Compound Interest”. *These are assumed rates of return. Broadly speaking, the economy and the markets are cyclical in nature. 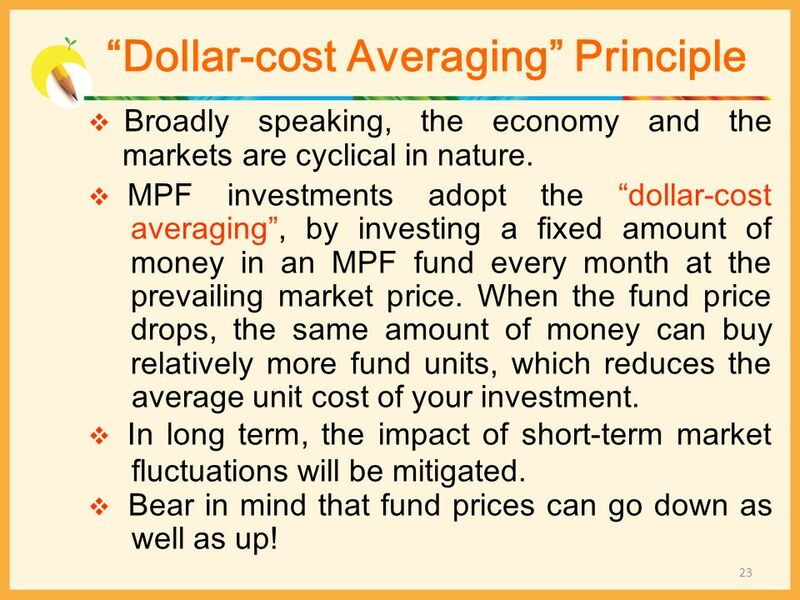 MPF investments adopt the “dollar-cost averaging”, by investing a fixed amount of money in an MPF fund every month at the prevailing market price. When the fund price drops, the same amount of money can buy relatively more fund units, which reduces the average unit cost of your investment. In long term, the impact of short-term market fluctuations will be mitigated. Bear in mind that fund prices can go down as well as up! Investments with higher potential returns come with higher potential risks. Source: Ibbotson Associates, as at June 22, 2010 *Average annualized 10-year rolling returns using monthly data from Jan 1926 to May 2010. 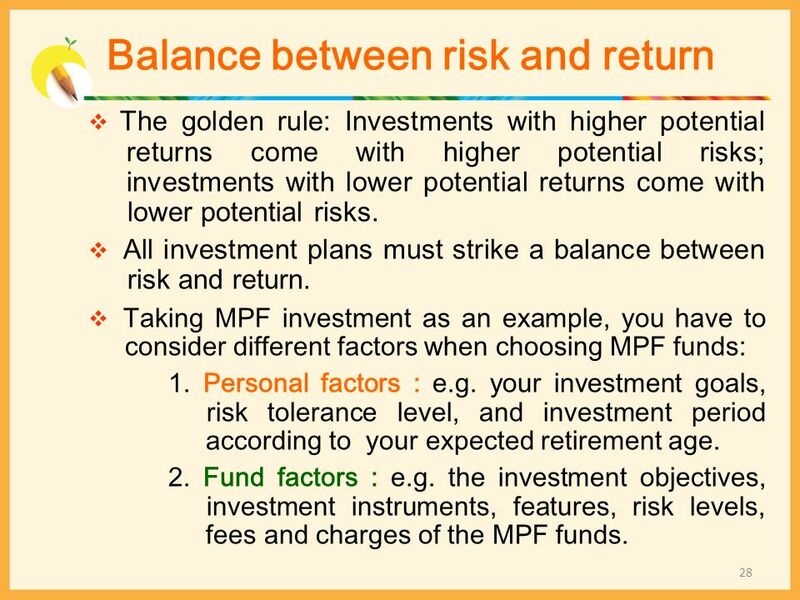 The golden rule: Investments with higher potential returns come with higher potential risks; investments with lower potential returns come with lower potential risks. 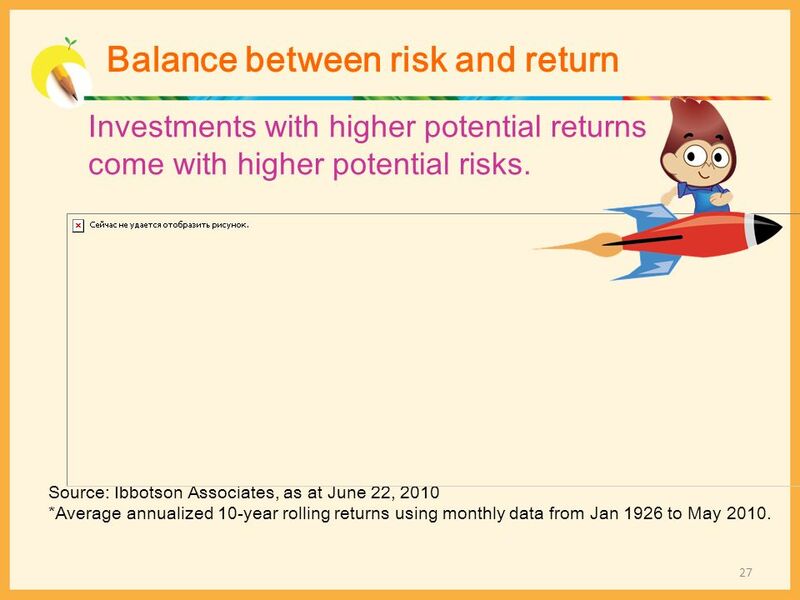 All investment plans must strike a balance between risk and return. 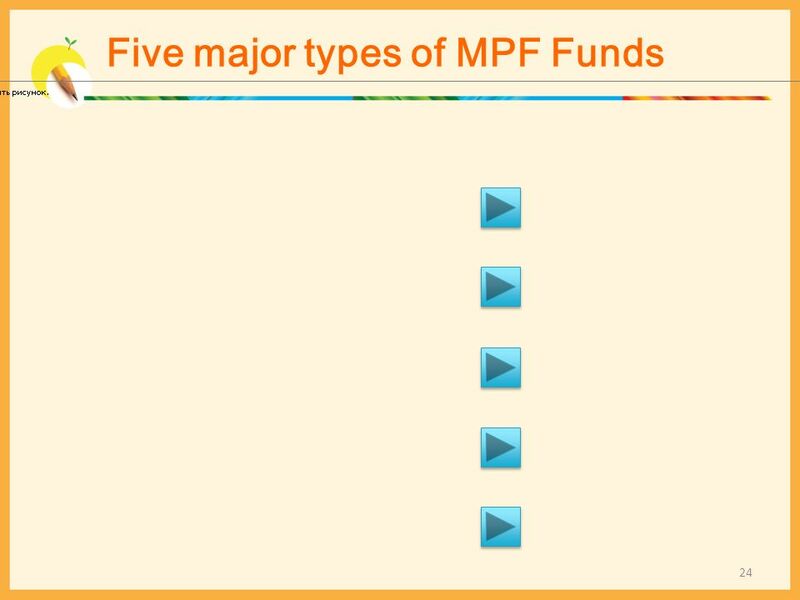 Taking MPF investment as an example, you have to consider different factors when choosing MPF funds: 1. Personal factors : e.g. 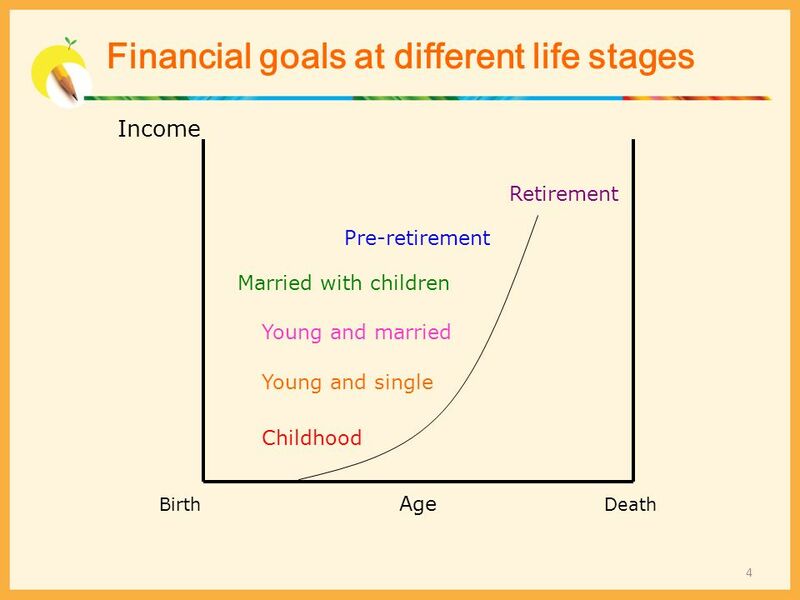 your investment goals, risk tolerance level, and investment period according to your expected retirement age. 2. Fund factors : e.g. 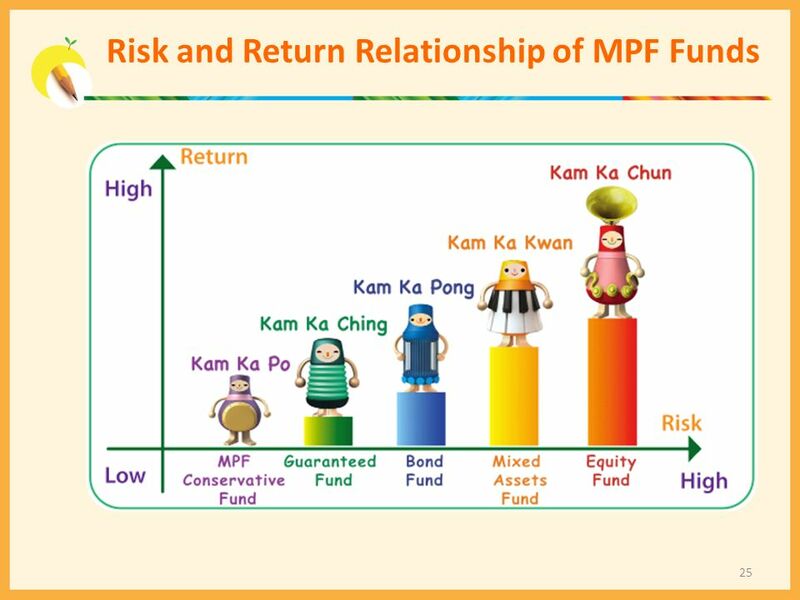 the investment objectives, investment instruments, features, risk levels, fees and charges of the MPF funds. Saving – Meeting emergency needs. Spending – Controlling consumptions in order to meet your savings goal. Protection – Creating a safety net for your loved ones. 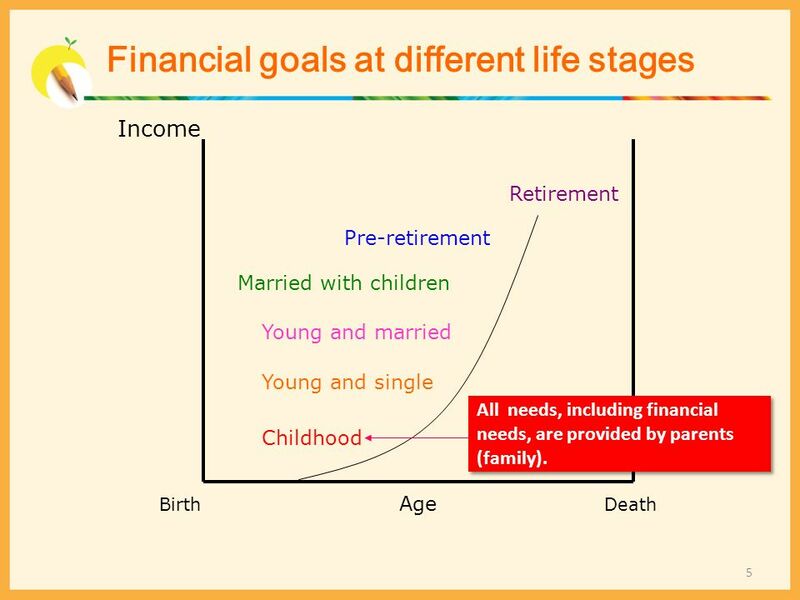 Investment – Accumulating sufficient wealth to meet your life goals (after you have met your saving and protection needs). 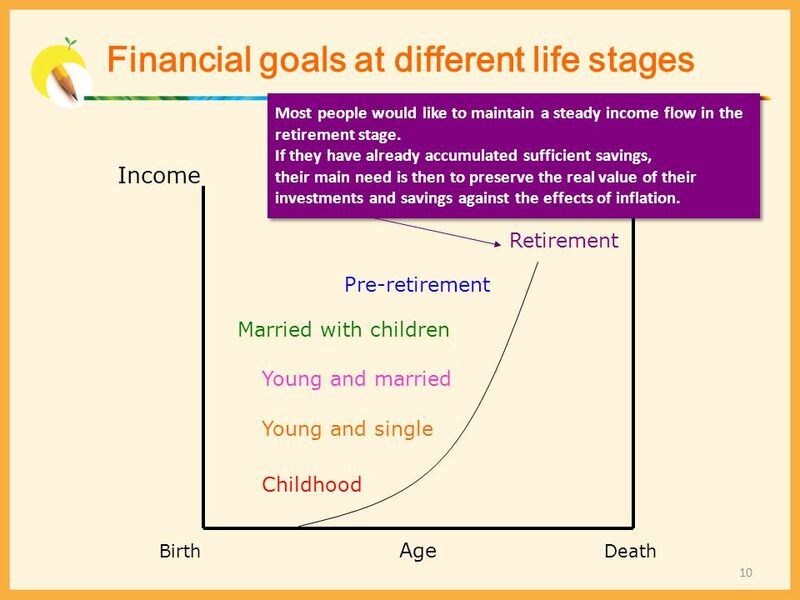 Retirement Planning – Investing or saving for your retirement. 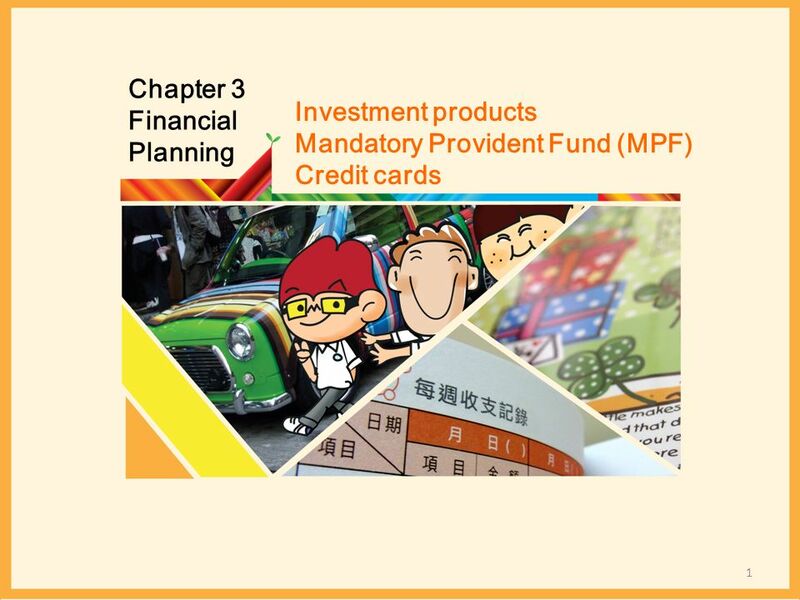 Download ppt "Chapter 3 Financial Planning Investment products"
CHAPTER 1: UNDERSTANDING THE FINANCIAL PLANNING PROCESS. 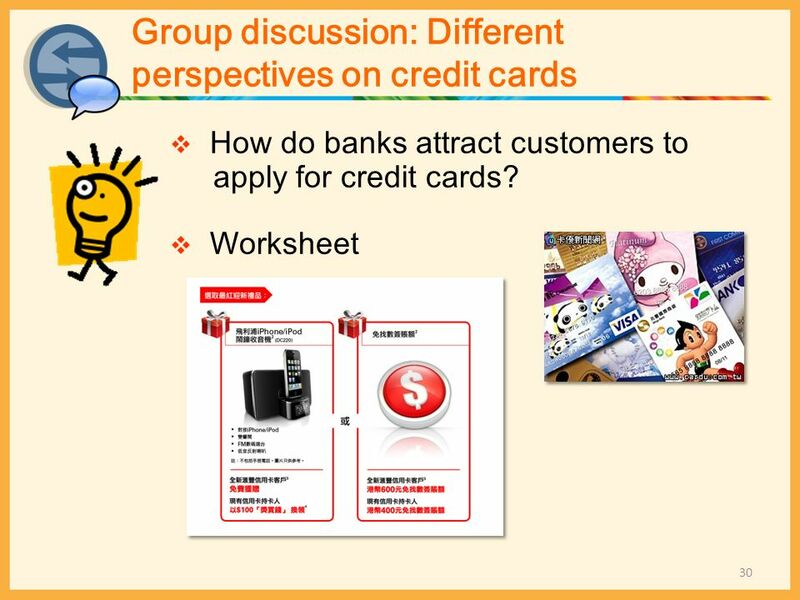 Copyright ©2004 Pearson Education, Inc. All rights reserved. 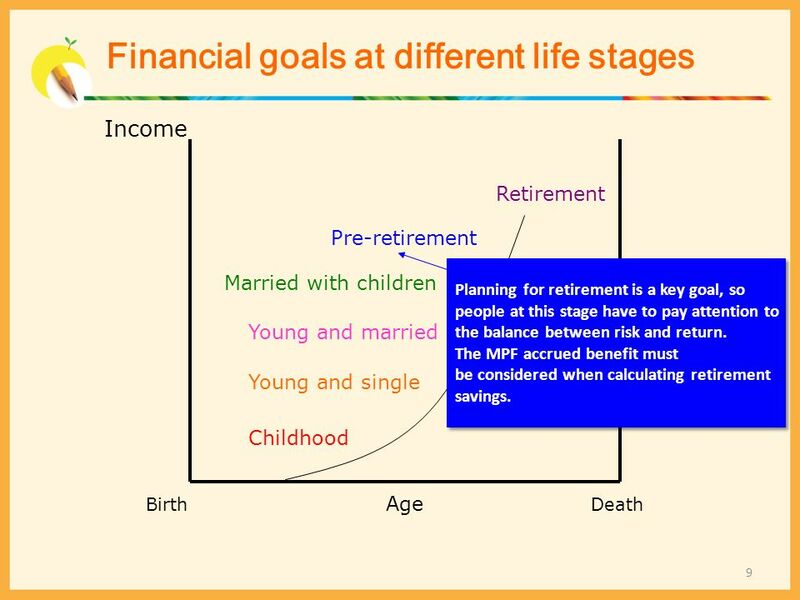 Chapter 1 Overview of a Financial Plan. Building: Knowledge, Security, Confidence Setting Financial Goals FDIC Money Smart for Young Adults.